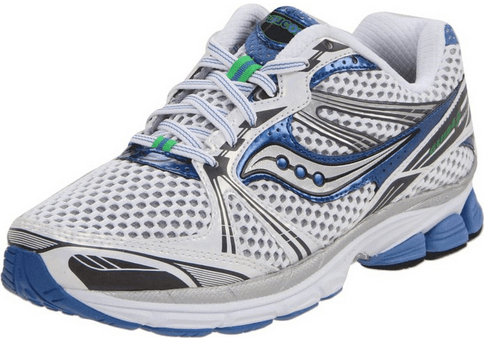 The Saucony Guide is a perfect running shoe no matter what distance you want to cover. This shoe offers both responsiveness and guidance. It gives priority to lightweight, support, stability, and support. You will like this shoe due to its lovely features. This running shoe is available in various versions. There is ProGrid for adults and junior size for kids and teens. Thus, you can buy this shoe for your kid if he/her has a flat feet problem. Midfoot and heel striker walking styles. Part gravel, part asphalt and forest trail applications. This shoe has synthetic overlays and breathable air mesh upper. The open mesh is light and covers the whole upper. The HRC Strobel Board offers soft underfoot cushioning. You will love the large toe box that offers toe comfort. HydraMax in the upper area offers comfort and absorbs moisture from your foot. Molded EVA ComfortLite Sock Lite contours to the arch and heel for comfort. A quick lacing system allows a snug fit. The plush tongue makes sure your foot is cozy in this shoe. The midsole is flat making this shoe light and dynamic. Midfoot Support Bridge has a thermoplastic material to enhance the torsional rigidity. This shoe offers you excellent heel support since the thermoplastic material is in the heel area. The dual density Super Lite EVA offers rebound and comfort. This material is durable and lightweight so you will use the shoe for long. The Super Rebound Compound in the midsole acts as a shock absorber. The outsole of this shoe has the latest technology. The heel part has XT-900 for durability and better traction. This rubber material also makes the shoe very flexible. An IBR+ in the forefoot area offers you extra cushioning and responsive ride. Outer sole grooves add flexibility allowing your foot to move freely. The outsole has rubber making it ideal for gravel, asphalt and forest trail. If you want a flexible shoe, this brand is a good choice. It has flex grooves on the outer sole for flexibility. The right amount of cushioning makes every stride enjoyable. You can wear it for training and long distance running. But it is a little bit flexible. The Comfortride inlay sole makes this shoe cozy and flexible. It offers a better experience for both midfoot and heel striker. You can use it all year round. You will appreciate its ability to correct foot pronation. It will suit mild and overpronators. It is a natural and training oriented shoe. It has a lightweight midsole that improves stability. Although it is less flexible, it offers enough arch support. The heel of this shoe has more cushioning for comfort and heel support. This shoe offers the right stability that you need for your flat foot. The women version weighs 258 grams while men version weighs 289 grams. Ideally, this shoe is very light. It is also smaller size but offers a cozy fit. Several features make it light. The upper has a light mesh cover. The lightweight midsole offers enough stability. Thus, you can run more with this light shoe. Q. Can I use this shoe for forest trail? A. Yes, it is good for forest trail, gravel, and asphalt. Q. What is the alignment of this shoe? A. It has a stability alignment. Q. Is this Progrid Guide enough for heel striker? A. Yes, it is good for both heel and midfoot striker. The best running shoe offers great support, stability and cushioning. Also, they are cozy. The Saucony pro grid guide 5 is such a shoe. It is a cozy that comes in a range of colors. It will suit you if you are moderate or over-pronator. A soft cushioning system allows you to run more. Quick lace system offers a snug fit. You will love the attractive upper. I hope the Saucony pro grid guide 5 review is invaluable. This pro grid guide 5 is a right purchase since it is durable and cozy.